Habit: Spiny, deciduous shrub, to 2.5 m (8 ft) tall and wide. Reproduction: By seed; cut stumps and stems; may self or cross. Leaves: Alternate, simple, entire, spatulate, 1.3-2 cm (1⁄2-3⁄4 in) long; bright green above, lighter below; in clusters at each node; fall color red to purple depending on the cultivar. Stems: Numerous, reddish-brown, angled or grooved, glabrous, usually with stiff, short, single spines 1.3 cm (1⁄2 in) long at the nodes; older stems gray; inner bark yellow; may be replaced every few years. Flowers: Small, perfect, 6 yellow petals, stalked; 1-4 in umbel-like clusters at the nodes; April–May; nectaries located on both sides of the 6 stamens, which have a tripping mechanism; the first visit removes over 50% of the sticky pollen; pollinated by bees. 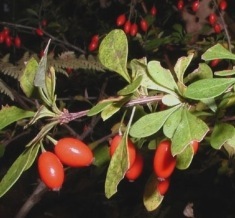 Fruits/Seeds: Early to late summer; bright red, dry, oblong to rounded berry 1-1.3 cm (3⁄8-1⁄2 in); 1 seeded; may remain on the shrubs through winter; production highest in high-intermediate light levels; cold stratification and alternating temperatures improve germination; over 90% of fruit falls within 1 m (3 ft) of each shrub but has been mapped as far as 80 m (262 ft); dispersed by birds (not a preferred food), deer, turkey, and grouse; fruit removal may be highest in low light. Habitat: Introduced into the U.S. between 1864-1879 from Japan; full sun to full shade; most soil types and habitats; dry ridgetops to wetlands and roadsides to closed canopy forests. Comments: Growth minimal in low light; survival of seed­ lings drops from 90% in intermediate-high light to 40% in low light, but survivors persist; leafs out before canopy and retains leaves after canopy leaf fall;16 deer herbivory minimal, but severe winter damage from rabbits; mortal­ity of stems or shrubs not related to population density; at least 47 cultivars; may alter soil conditions to its benefit by increasing pH, nitrification, and nitrate; association with non-native earthworms possibly due to increased litter decomposition or an agricultural connection. 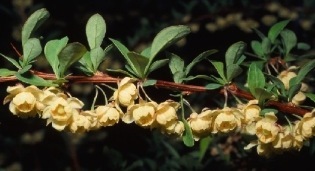 Similar Native Species: American barberry (B. canadensis); toothed leaves and usually 3-pronged spines.